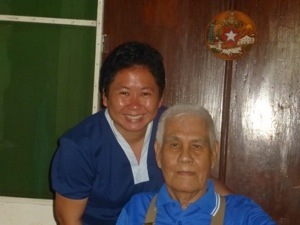 Tito Erny is one of my father’s older brothers. He used to take care of me when I was young. He didn’t have kids of his own then, so he would take me, my siblings and our two cousins to the movies. I can’t imagine trying to take on six children (aged 5 – 10) to Cubao by public transportation, all by himself. He has always been very generous, sometimes to a fault. Today, he celebrates his 85th birthday. Happy birthday, Tito Erny, and wishing you many more birthdays to come! This entry was posted in Family, Grateful Project and tagged Grateful Project, Tito Erny. Bookmark the permalink.